When Demi Lovato played a 90-minute show on Sunday night at Charlotte's Time Warner Cable Arena as part of the Neon Lights Tour, she kind of managed to slay it, to put it mildly. The girl can sing. Really sing. Anyone even vaguely familiar with any of her Top-40 hits can attest to that. It came as no surprise. 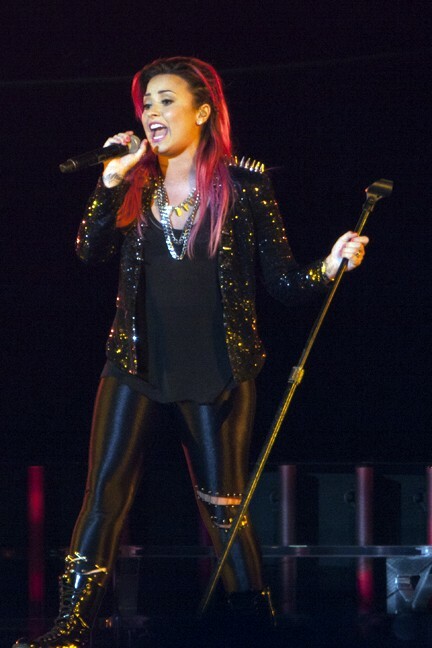 The real surprise was that Lovato managed to make an arena show feel more like an intimate club performance. She didn't need flash to put on a great show. All she needed on a sparsely decorated stage was emotion and the talent with which Lovato sang hits and old and new, although a pretty cool light display was a nice addition. Lovato hails from the same Disney generation as Miley Cyrus, who has become notorious for her overly sexualized image as of late. The difference? 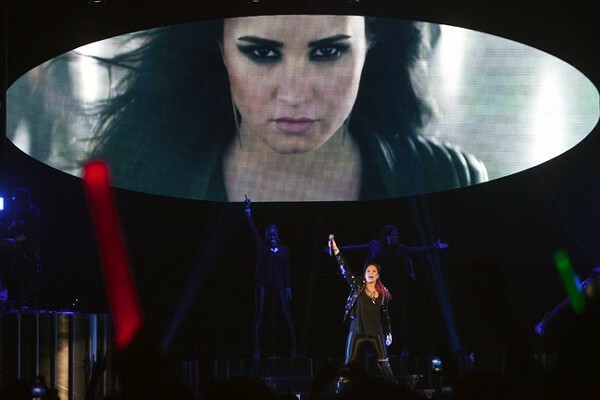 Lovato shows maturity far beyond her years, both in her performance and in her message. She got her start as a child start on the TV show Barney & Friends and went on to teen-queen status appearing with the Jonas Brothers in the Disney musical Camp Rock. That's not exactly the formula for a typical rock star, but she is one. Whereas former teen queens like Cyrus are going above and beyond to cultivate an image of raunchiness and sexuality in an effort to strip away any remnant of the Disney empire, Lovato doesn't need to pull those antics to set herself apart. That's primarily because her vocal ability manages to speak for itself but also because Lovato doesn't seem to feel the need to produce an "image." What you see is what you get, and there's no shame in who she used to be. 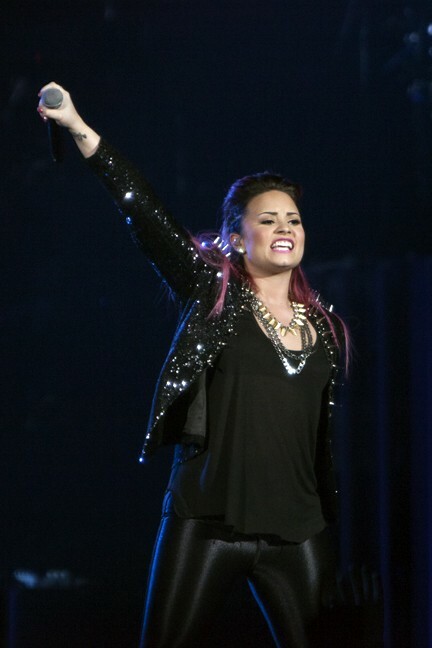 Every fan in the arena already knows about her struggles with cutting, drugs and an eating disorder. They were well documented when she entered rehab in 2010, something she has been open about since beginning her recovery. She went through hell and back before she was considered a legal adult and unlike other stars that came through the Disney machine, she didn't hide her struggles or flaunt her former hard-partying ways. Her imperfections are what have brought her success and her advocating for "staying strong" has brought her a connection for her fans that she says goes "beyond" what is already a "beautiful connection through music." At one point in her show, Lovato sat at a piano with a lone spotlight on her as she looked to her fans and pleaded with them to hear her out. "I want you, and all of you parents out there too, because this is very serious, to take a minute to just listen," she said. "If you've ever struggled with cutting, if you've ever struggled with mental issues or depression or an eating disorder, I want you to know that it's okay that you got lost. And you will survive. I'm up here as living proof." Beginning to play the keys for what has become her army of fans ("Lovatics") theme song of survival, "Warrior," Lovato sang the anthem with so much heart that it's obvious her demons are always going to be there. "I've got shame, I've got scars that I will never show," she sings on the song. But her strength shines through despite the obvious pain she was in when she wrote the song: "I'm a survivor in more ways than you know." The show is one big celebration of how far she's come and, as she repeats constantly, it's all thanks to her fans. Every moment of the show is for them and at no point does Lovato ever make it seem like it's about her. While other young pop stars typically use a performance as their chance to show off the goods and make it all about them. 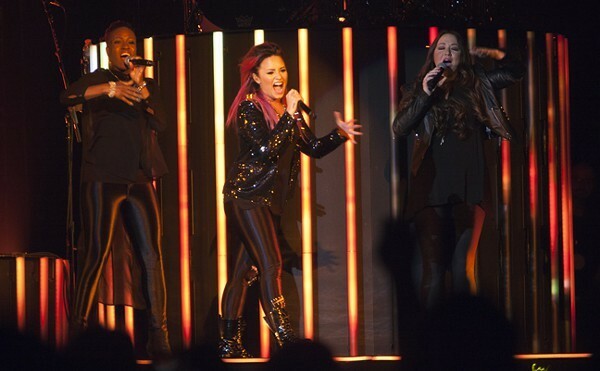 Lovato creates a show that is about honoring the fans and honoring both her present and her past. She injected a bit of nostalgia by throwing back to her time as a counterpart to the Jonas Brothers, presenting a series of video clips showing her younger self - and her much more troubled self - while singing old Disney hits like "Here We Go Again" and "Don't Forget." In a heartbreaking moment, before launching into "Don't Forget," Lovato introduced the song saying "These old songs used to be really sad for me, they used to make me really sad. But now I can sing them and just have fun." Her vocal range is incredible and her live performance is nearly flawless, but her strength and maturity was constantly on display and it's what her fans love about her. She stayed strong. And still does for them.